Please note that the content of this book primarily consists of articles available from Wikipedia or other free sources online. Anatoli Bogdanov (Russian: ; born June 7, 1981 in Leningrad, now St. Petersburg) is a Russian professional footballer. He also holds Kazakhstani citizenship. 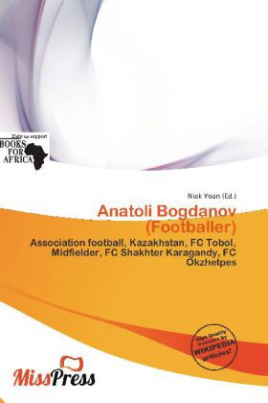 He plays for FC Tobol. A midfielder is an association football position. Some midfielders play a more defensive role, while others blur the boundaries between midfielders and forwards. The number of midfielders a team uses during a match may vary, depending on the team's formation and each individual player's role. The group of midfielders in a team is called the midfield.